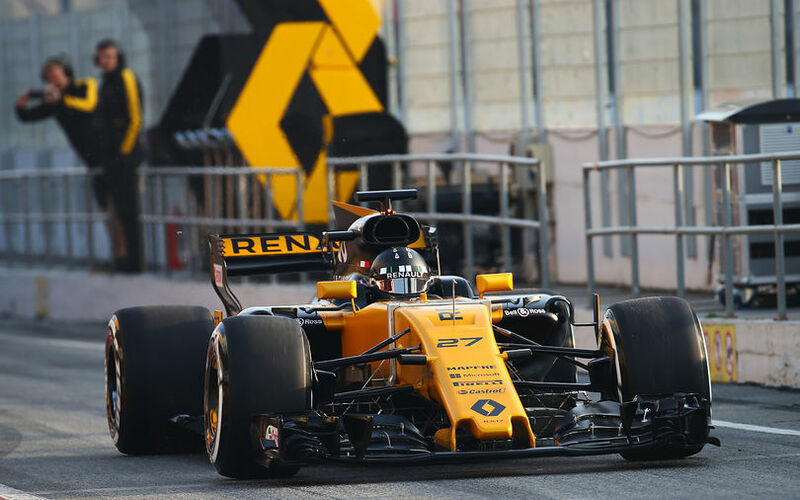 F1 winter testing has kicked off today at Circuit de Catalunya at 9h local time, commencing the first of two 4-day test sessions before the inaugural Grand Prix of the 2017 season. Renault was the first to get is car out, following by all others in the first 10 minutes. While all went reasonable well on the first laps, Red Bull's second outing with the RB13 was less promising as Ricciardo already came to a halt at turn 3. After getting the car back during the subsequent red flag situation, the team quickly discovered a simple sensor failure, but one that was difficult to reach, resulting in some time in the pitlane. McLaren's Alonso was worse off still, with the Spaniard not coming out after the installation lap for hours, getting halted by a Honda power unit issue. More fortunate was Valtteri Bottas in the Mercedes, who after 2 hours had already completed 22 laps, the fastest of which in 1:23.370. At the time, a whopping 13s quicker than Vettel in the Ferrari who had lapped 18 times, carrying flowviz mostly on the rear wing. Later on, Haas's Kevin Magnussen went off-track but returned the VF-17 seemingly undamaged. The team did need to clean some grass from the pitlane though. During the afternoon, Alonso continued to be sidelined until eventually McLaren had switched the engine on the MCL32, deciding it was a quicker option than to try to repair the engine. It was found though that the problem was an oil issue, a difficult issue to resolve as the oil reservoir and pump are all located ahead of the engine, requiring the power unit to be removed from the chassis. A similar story with Red Bull Racing, who experienced a battery problem after the failing sensor that initially forced the car to a halt. Felipe Massa did have a productive day, and was at the top of the timesheets for a while in the afternoon, until Vettel and Hamilton further improved their own times. As others also improved, Sergio Perez dropped down the pecking order as his team encountered several exhaust issues before opting to end the day early.